This entry was posted in Faculty, General News and tagged award, navy, nursing on December 11, 2012 by Wire Eagle. AUBURN UNIVERSITY – David R. Crumbley, a new assistant clinical professor in the School of Nursing at Auburn University, recently received the Meritorious Service Medal from the U.S. Navy. 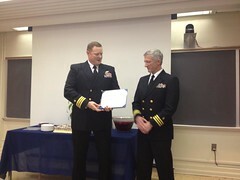 As stated in the official citation, Crumbley, a 23-year veteran of the U.S. military, received the award for “exceptional professionalism, personal initiative and loyal devotion to duty” while serving with the United States Naval Service as deputy surgeon general liaison to the Federal Recovery Care Program in the Veterans Administration Central Office from May 2011 to July 2012. Crumbley enlisted in the U.S. Army after high school and learned to be a medic. After three years, he enrolled in college to earn a nursing degree and then returned to the military, joining the U.S. Navy, which funded his master’s degree at the Medical University of South Carolina. He spent 20 years as a Navy Nurse Corps Officer before retiring with the rank of commander. This entry was posted in Students and tagged award, College of Human Sciences, family relations on August 15, 2012 by Wire Eagle. AUBURN UNIVERSITY – The National Council on Family Relations has selected Mallory Lucier-Greer, a recent Ph.D. graduate in the Department of Human Development and Family Studies in Auburn University’s College of Human Sciences, to receive the council’s 2012 Outstanding Graduate Student Award. This is the second consecutive year a student from the Department of Human Development and Family Studies at Auburn has been recognized by the NCFR, the premier professional association for the multidisciplinary understanding of families. 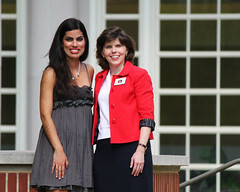 Graduate student Cassandra Kirkland received the honor in 2011. This entry was posted in General News and tagged animal sciences, award on May 12, 2011 by Wire Eagle. AUBURN – Auburn University was named by the U.S. Department of Defense as one of 148 semifinalists for the 2011 Secretary of Defense Employer Support Freedom Award, the highest recognition the defense department gives to employers for exceptional support of their employees who serve in the U.S. Army National Guard and Reserve. Auburn is the only college or university among the semifinalists. Soren Rodning, an assistant professor in the Department of Animal Sciences at Auburn and a U.S. Army reservist who was deployed to Afghanistan from August 2010 through mid-March with the veterinary service unit of the 358th Medical Detachment, nominated the university for the honor. 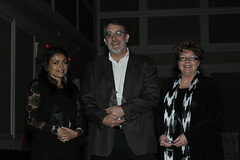 This entry was posted in Athletics, Events and tagged award, coach, football on April 15, 2011 by Wire Eagle. AUBURN – The official presentation of Liberty Mutual’s Coach of the Year award will take place April 16 at Auburn University’s A-Day game during a pre-game ceremony. Auburn alumni cast more than 80,000 votes for coach Gene Chizik in the first round, a new record for the competition. Howard Nelson, board member of the Auburn Alumni Association and chair of the scholarship committee, will accept the $30,000 check on behalf of the alumni association from Liberty Mutual. Liberty Mutual made a $50,000 donation to the charities of Chizik’s choice, which were aTeam Ministries and the Boys and Girls Clubs of Greater Lee County. Representatives from these organizations will attend the presentation to accept their checks.